The purpose of this assignment is to create the input workbook for yeast mutant Δzap1 to be ran through GRNmap. GRNmap (Gene Regulatory Network Modeling and Parameter Estimation) will then create the model of how genes cluster within the mutant interact, i.e. how genes regulate each other by activating or repressing other genes. 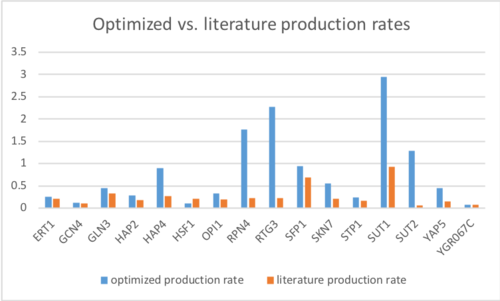 This sheet contains initial guesses for the production rate parameters, P, for all genes in the network. Assuming that the system is in steady state with the relative expression of all genes equal to 1, (P/2) - lambda = 0, where lambda is the degradation rate, is a reasonable initial guess. The sheet should contain two columns (from left to right) entitled, "id", "production_rate". The id is an identifier that the user will use to identify a particular gene. In our case, we are using the "StandardName", for example, GLN3. The "production_rate" column should then contain the initial guesses for the P parameter as described above, rounded to four decimal places. The production rates are provided in a Microsoft Access database, which you can download from here. To perform the query, you will need to follow these steps. Import a your list of genes to a new table in the database. Click on the "External Data" tab and select the Excel icon with the "up" arrow on it. Click the "Browse" button and select your Excel file containing your network that you used to upload to GRNsight. Make sure the button next to "Import the source data into a new table in the current database" and click "OK". In the next window, select the "network" worksheet, if it hasn't already been automatically selected for you. Click "Next". In the next window, make sure the "First Row Contains Column Headings" is checked. Click "Next". In the next window, the left-most column will be highlighted. Change the "Field Name" to "id" if it doesn't say that already. Click "Next". In the next window, select the button for "Choose my own primary key." and choose the "id" field from the drop down next to it. Click "Next". In the next field, make sure it says "Import to Table: network". Click Finish. In the next window you do not need to save the import steps, so just click "Close". A table called "network" should appear in the list of tables at the left of the window. Go to the "Create" tab. Click on the icon for "Query Design". In the window that appears, click on the "network" table and click "Add". Click on the "production_rates" table and click "Add". Click "Close". The two tables should appear in the main part of the window. We need to tell Access which fields in the two tables correspond to each other. Click on the word "id" in the network table and drag your mouse to the "standard_name" field in the "production_rates" table, and release. You will see a line appear between those two words. Right-click on the line between those words and select "Join Properties" from the menu that appears. Select Option "2: Include ALL records from 'network' and only those records from 'production_rates' where the joined fields are equal." Click "OK". Click on the "id" word in the "network" table and drag it to the bottom of the screen to the first column next to the word "Field" and release. Click on the "production_rate" field in the "production_rates" table and drag it to the bottom of the screen to the second column next to the word "Field" and release. Right-click anywhere in the gray area near the two tables. In the menu that appears, select "Query Type > Make Table Query...". In the window that appears, name your table "production_rates_1" because you can't have two tables with the same name in the database. Make sure that "Current Database" is selected and Click "OK". Go to the "Query Tools: Menus" tab. Click on the exclamation point icon. A window will appear that tells you how many rows you are pasting into a new table. Click "Yes". Your new "production_rates_1" table will appear in the list at the left. Double-click on that table name to open it. You can copy the data in this table and paste it back into your Excel workbook. Make sure that when you paste that you use "Paste Special > Paste values" so that the Access formatting doesn't get carried along. You can also choose to export this table to Excel going to the "External Data" tab and selecting the Excel icon with the arrow pointing to the right. Select the workbook you want to export the table to, making sure that "Preserve Access formatting" is not checked. Click "OK", click "Close". Note that the genes should be listed in the same order in all the sheets in the Excel workbook. This sheet contains degradation rates for all genes in the network, which are provided by the user. Currently, the Dahlquist Lab is using data based on published mRNA half-life data from Neymotin et al. (2006). We converted the half-life data values to the degradation rates by taking the natural log of the half-life and dividing by 2. The sheet should contain two columns (from left to right) entitled "id", and "degradation_rate". The id is an identifier that the user will use to identify a particular gene. The "degradation_rate" column should then contain the absolute value of the degradation rate for the corresponding gene as described above, rounded to four decimal places. To obtain these values, you will use the same file, [Microsoft Access database, which you can Expression-and-Degradation-rate-database_2019.accdb that you used to obtain the production rates in the first worksheet. Again, you can copy and paste the values one-by-one or you can follow the instructions to execute a query, substituting the appropriate "degradation_rates" table in the query. Note that you don't need to re-import your "network" table, you just need to create and execute the query. Again note, the genes should be listed in the same order in all the sheets in the Excel workbook. Expression data can be provided for either a single strain or multiple strains of yeast (for example, the wild type strain and a transcription factor deletion strain). Each strain will have its own sheet in the workbook. Each sheet should be given a unique name that follows the convention "STRAIN_log2_expression", where the word "STRAIN" is replaced by the strain designation, which will appear in the optimization_diagnostics sheet. Everyone in the class will have at least one expression worksheet called "wt_log2_expression". You should have included the transcription factors GLN3 and HAP4 in your network. Thus, we will use the expression data from the dGLN3, dHAP4, dZAP1 deletion strains in our workbooks as well, naming the worksheets "dgln3_log2_expression" and "dhap4_log2_expression"
"id": list of all genes. The genes should be listed in the same order in all the sheets in the Excel workbook. The next series of columns should contain the expression data for each gene at a given timepoint given as log2 ratios (log2 fold changes). The column header should be the time at which the data were collected, without any units. For example, the 15 minute timepoint would have a column header "15" and the 30 minute timepoint would have the column header "30". GRNmap supports replicate data for each of the timepoints. Replicate data for the same timepoint should be in columns immediately next to each other and have the same column headers. For example, three replicates of the 15 minute timepoint would have "15", "15", "15" as the column headers. If data are provided for multiple strains, each strain should have data for the same timepoints, although the number of replicates can vary. Include the data for the 15, 30, and 60 minute timepoints, but not the 90 or 120 minute timepoints. It is tedious to copy and paste all of these data by hand, so we will execute a query in Microsoft Access to do it for you. Follow the steps listed for the "production_rates" sheet for each strains expression data. After you import the data into Excel, you will need to change the column headers to "15", "15", etc., as described above. Copy and paste the network from the YEASTRACT database. This sheet contains an adjacency matrix representation of the gene regulatory network. The columns correspond to the transcription factors and the rows correspond to the target genes controlled by those transcription factors. A “1” means there is an edge connecting them and a “0” means that there is no edge connecting them. The upper-left cell (A1) should contain the text “cols regulators/rows targets”. This text is there as a reminder of the direction of the regulatory relationships specified by the adjacency matrix. The rest of row 1 should contain the names of the transcription factors that are controlling the other genes in the network, one transcription factor name per column. The rest of column A should contain the names of the target genes that are being controlled by the transcription factors heading each of the columns in the matrix, one target gene name per row. The transcription factor names should correspond to the "id" in the other sheets in the workbook. They should be capitalized the same way and occur in the same order along the top and side of the matrix. The matrix needs to be symmetric, i.e., the same transcription factors should appear along the top and left side of the matrix. The genes should be listed in the same order in all the sheets in the Excel workbook. Each cell in the matrix should then contain a zero (0) if there is no regulatory relationship between those two transcription factors, or a one (1) if there is a regulatory relationship between them. Again, the columns correspond to the transcription factors and the rows correspond to the target genes controlled by those transcription factors. These are the initial guesses for the estimation of the weight parameters, w.
Since these weights are initial guesses which will be optimized by GRNmap, the content of this sheet can be identical to the "network" sheet. The optimization_parameters sheet should have two columns (from left to right) entitled, "optimization_parameter" and "value". You should copy this worksheet from the sample workbook provided. The only row that you need to modify is row 15, "Strain". Include just the strain designations for which you have a corresponding STRAIN_log2_expression sheet. What follows below is an explanation of what the optimization_parameters mean. kk_max: Number of times to re-run the optimization loop. In some cases re-starting the optimization loop can improve performance of the estimation. MaxIter: Number of times MATLAB iterates through the optimization scheme. If this is set too low, MATLAB will stop before the parameters are optimized. TolX: How close successive least squares cost evaluations should be before the program determines that it is not making any improvement. L_curve: =0 if an L-curve analysis should NOT be run or =1 if an L-curve analysis SHOULD be run. The L-curve analysis will automatically run sequential rounds of estimation for an array of fixed alpha values (0.8, 0.5, 0.2, 0.1,0.08, 0.05,0.02,0.01, 0.008, 0.005, 0.002, 0.001, 0.0008, 0.0005, 0.0002, and 0.0001). GRNmap makes a copy of the user's selected input workbook and changes alpha to the first alpha in the list. The estimation runs and the resulting parameter values are used as the initial guesses for the next round of estimation with the next alpha value. This process repeats until all alpha values have been run. New input and output workbooks are generated for each alpha value, although currently, the graphs are only saved for the last run. expression_timepoints: A row containing a list of the time points when the data was collected experimentally. Should correspond to the timepoint column headers in the STRAIN_log2_expression sheets. Strain: A row containing a list of all of the strains for which there is expression data in the workbook. Should correspond to the "STRAIN" portion of the names of the STRAIN_log2_expression sheets for each strain. Note that GRNmap will run the model for the wild type network (all genes present in the network) and for networks where the gene deleted from the designated STRAIN has been deleted from the network. simulation_timepoints: A row containing a list of the time points at which to evaluate the differential equations to generate the simulated data. This does not need to correspond to the actual measurement times, but should be in the same units (e.g. minutes). 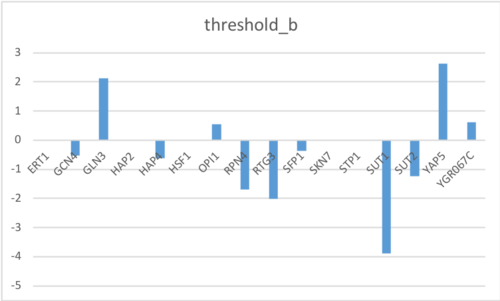 These are the initial guesses for the estimation of the threshold_b parameters. There should be two columns. The left-most column should contain the header "id" and list the standard names for the genes in the model in the same order as in the other sheets. The second column should have the header "threshold_b" and should contain the initial guesses, we are going to use all 0. Once you have completed your input workbook, either upload it to Box and provide a link to it in your electronic notebook. You should save your work in progress to Box so that if either Dr. Dahlquist or Dr. Fitzpatrick needs to help you troubleshoot, we will have access to your work. Now you are ready to run the model and analyze the results. The software we will use is called GRNmap, which stands for Gene Regulatory Network Modeling and Parameter Estimation. It is written in MATLAB and can be run from code or run as a stand-alone executable if you don't have MATLAB installed. However, it can only be run in Windows, not on Macs. To run GRNmap from code, you must have MATLAB R2014b installed on your computer. Download the GRNmap v1.10 code from the GRNmap Downloads page. This is a direct link to start downloading (81 MB). Click the Run button (green "play" arrow). You will be prompted to select your input workbook. You will see an optimization diagnostics graphic that shows the progress of the estimation. When the run is over, expression plots will display. Output .xlsx and .mat files will be saved in the same folder as your input folder, along with .jpg files containing the optimization diagnostic and individual expression plots. Save these files. Note that if you need to run GRNmap again, you should not use the same directory for the input file. Currently, GRNmap will overwrite previous output. You can upload your output .xlsx file into GRNsight to visualize the results! Making bar charts to give a graphical representation of the parameter values. There was a bug when I ran my GRNmap output workbook on GRNsight, so I could not determine goodness of fit for the genes. The first part of the assignment was creating the input workbook that will be ran through GRNmap. This workbook includes the network sheets of the gene cluster used for YEASTRACT, wherein each it gathers the data for gene's production rate, degradation rate, expression data. I copied the methods from the Week 6 Assignment Page but changed the generic methods to be accurate to what I did. Dahlquist, K. and Fitzpatrick, B. (2019). BIOL388/S19:Week 6. [online] openwetware.org. Available at:Week 6 Assignment Page [Accessed 27 Feb. 2019].